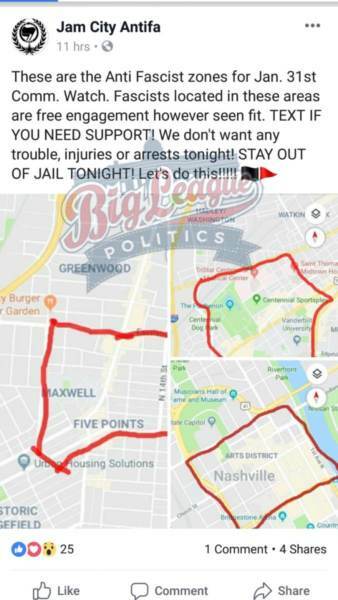 The violent alt-left group Antifa, which has been identified by the United States government as a domestic terrorist group, publicly called for “anti-fascist” zones in Nashville, Tennessee over the New Year’s holiday. According to Big League Politics journalist Luke Rohfling, JAM City Antifa made a decree on their Facebook page calling for “engagement” against people they identified as “fascists”. The post was later deleted, but represents a troubling new normal from violent alt-left groups like Antifa who commit rampant acts of violence against their political opponents. Next Next post: Ocasio-Cortez Gets Nasty With Steve Scalise, Her Supporters Threaten Him. His Response Is Perfect.